halfway down. Styrene plastic track, trestle. About 23x23xl5 m. high. Track Pack and Finish Gate. Use with Hill above or wi th other sets. end. 32 feet of hot strip track . "O" Batteries. Pkg. of 6. Shpg. wt. I lb. 8 oz. and numbers. 13x6x8 inches high. Reinforced vinyl. 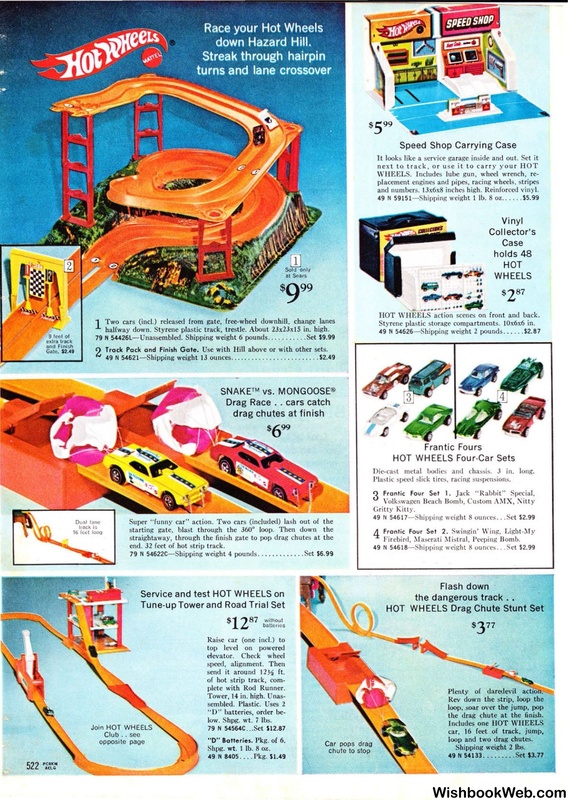 HOT WHEELS actio11 scenes on front and back. Styrene plastic storage compartments. !Ox6x6 in. Die-cast metal bodies and chassis. 3 in. long. Plastic speed slick tires, racing suspensions. Firebird, '.\faserati Mistral , Peeping Bomb. P lenty of daredevil action. the drag ch'ute at the fi nish. loop and two drag chutes.